Thank G-d for wonderful teachers! 2448 years to learn to appreciate His Creation and to respect it, but after 2440 of those 2448 years, I wouldn’t want to have to bring home our report card. And this I don’t expect my daughter’s class to understand: Those 2448 years divided by the 4 exiles work out to an average of 2448/4 = 612 and 612 is the gematria value of the word Brit, Covenant, as in G-d first Covenant with earth, the rainbow. At the end of the 4th exile, in the year 5778 HC , (2018 CE) as advised to us by the tzaddikim of blessed memory, G-d will fulfill with us his Covenant with Abraham, made in 2018 HC. So, after the first 1658 years of our creation, at the time of the flood, how devastating was it for G-d? How hard was it for him to crumple up the beautiful earth that it seemed only He appreciated? In out terminology it must have been very painful, so painful he vowed not to do it again. It was so painful that he gave us another 4120 years, or 4120/1658 = 2.485 times as long as He had given the generation of Noach. Sure 4120 = 1o x 412 (the numerical value of the letter bet(B) the first letter in the Torah and of the word Beit as in the Beit Hamikdash, or Holy Temple, but frequent readers of this blog should recognize 248 as Abraham and as racham (mercy) and also 2485. Especially since 5778 K is the surface temperature of the Sun and 248.5 is the surface temperature of the Earth, so it appears the destruction of the Flood was planned and known at the moment of Creation when the surface temperatures (radiances) of the Earth and Sun where set. But just because it was planned, doesn’t mean it didn’t pain him. G-d, the Light if you will is in all creation and thus at the level that we can understand G-d loves all things and it pains him at the willful destruction even of a blade of grass, let alone all of civilization. Yet with the intensity that he must have felt our suffering, like a parent who suffers at punishing and thus depriving a child from something that he really enjoys in order to help him understand right from wrong, G-d did it for us. I guess you could say that all that water came from His tears, which is why it’s so salty. And what about the destruction of the First Temple in 3338 HC, since its ratio with the Flood date 1658/3338 is .49670 or nearly exactly 2 x 248.5. 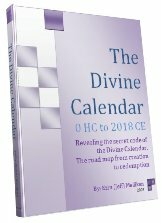 Readers of The Divine Calendar know that all the significant Biblical dates line up in a beautiful awe-inspiring well-planned time-line, including Israel’s statehood in 1948 CE echoing Abraham’s birth in 1948 HC and the midpoint of King David’s life in 2889 HC being the midpoint between Adam and Moshiach in 5778 HC, but beyond the awe that this should inspire in us, what it should tell us is how much G-d loves us. He could have ended it all in 1658, or 3338, but that wasn’t His plan. He had planned on the year 5778 HC (2018 CE) all along, and He meant for our generation to be the one to receive H’Mashiach from day 1, so knowing we we’re so loved, that we are the chosen people, how are we showing our appreciation? More than any generation before us, we should be showing it today. Even more than those kindergarten students respect their wonderful teacher, and even more than they love their parents, we should be respecting and loving G-d and all his creations. So I repeat, I wouldn’t want to see our report cards. When 5778 comes around, G-d willing (B’H), none of us will be in detention. 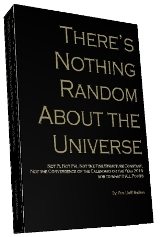 Author Jeffrey MeilikenPosted on February 13, 2009 Categories RevelationsTags 1658, 1948, 2018, 2018 ce, 2448, 248, 248.5 K, 2485, 3338, 5778, 5778 K, abraham, Adam, brit, covenant, covenant of abraham, David, first temple, h'mashiach, Holy Temple, Israel, jewish, judism, king david, Mashiach, Moshiach, noach, noah, the flood, tikkun olam, TorahLeave a comment on What G-d Thought.